I’m speaking at the #StartNow conference! 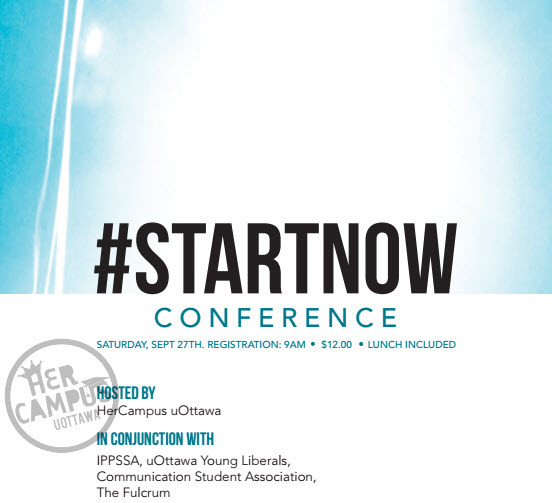 This Saturday I’m participating in a Women in the Workplace panel at the #StartNow Student Leadership conference taking place at the University of Ottawa. Organized by the Her Campus UOttawa chapter, I’m pretty darn excited to be included. My fellow panelists include Karen C. Wilson of Wellman Wilson Consulting and Alicia Natividad, Barrister and Sollicitor. We’ll discuss our career paths, including the pressures and successes we’ve faced and achieved in the workplace. I’m sure everything from the glass ceiling to family-life to our own career mistakes hiccups will be shared. 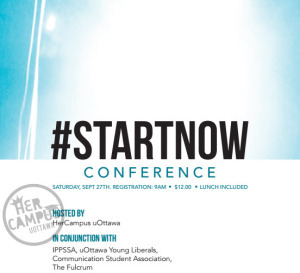 Tickets to the #StartNow conference are $12 and on sale now. There’s a great lineup of speakers and learning – you should totally go! Hi…it’s been a long time..I am happy to hear your good news-congrats!